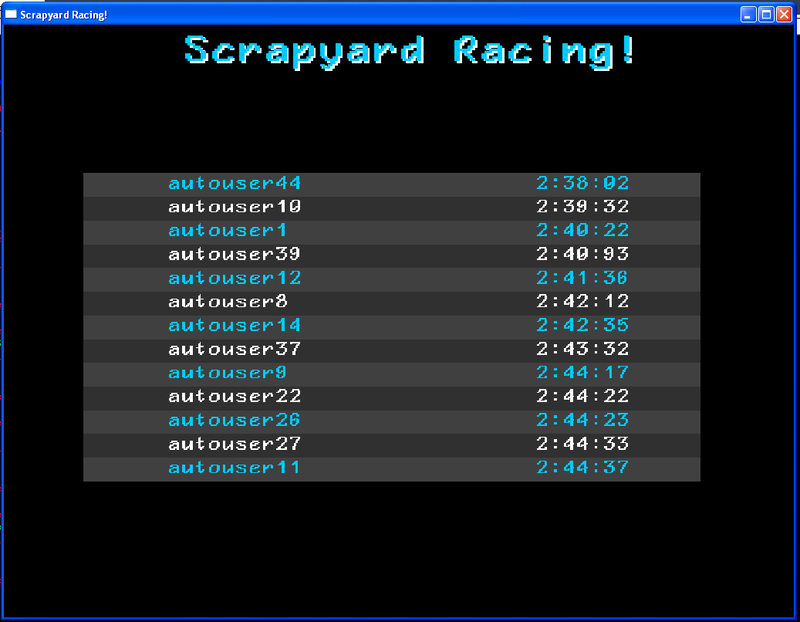 Over the past week I have been making random improvements to Scrapyard Racing! First I started with some user interface / heads up display stuff, but have yet to finish. My lack of artistic value is draining me. I then started playing with the best lap times database, and in-game display/interface. First I started with populating the database with a bunch of generated users with random personal best times. Now I have used those records to test the in-game display. Which I must say is coming along nicely, even if it isn’t yet complete. I need to add some navigation buttons, but I assure you I’ve tested it with a few hotkeys at this time. There are three major additions until I can say the records are complete. First I need to actually add records from game when the player makes a new personal best. I also would like to see the ability to search for a friend by their user name to see their time / how much bragging rights you have over them… The final one is going to remain undisclosed, as I haven’t had a chance to make sure I can pull it off; but it would be a nice feature. Besides the timing charts, I’ve been working on moving my website around to this new place, of awesome. I would like to make a video of me editing a track, as well as making a few tracks since I’ve only been testing on the one. I haven’t done much gameplay wise. The car is still a tad sluggish, and you still don’t need to use the brakes, but it is easier to drive compared to previous versions, and I think that is a pretty important part. I may have failed to make my October Alpha goal, but I doubt I’ll fail to release this; the better question is when? I would love to see it released within 2010, likely near December. But I assure you, I have a long ways to go, and that is my dream time frame. I have extremely high doubts on hitting the target. Enjoy. Okay, so I did not quite get where I wanted to this October, but it would have been a challenge even if my free time would have been higher. Work related stuff ended up taking a lot of my time, for almost 10 days in a row I was unable to make much progress at all, then work started slowing down, but I had an opportunity for a programming test; which ultimately failed as I found out last night. These are not excuses, as much as the truth of why I didn’t get where I wanted. I am actually quite far behind schedule now, although I am still holding high hopes that I can sell a copy by December 31st. I see more and more people are starting to become interested, as I released a video of the game in replay mode last week, and have had a few instant messages with congratulations and stuff. Overall I still feel positive about the project, and even after a few weeks of “here and there” development I think things are coming together nicely. I still need to edit the physics of the car/world, and need work on the user interface of the game. One small piece of the gameplay portion exists before I start adding all the dressing and polish that will turn it from a ‘game’ into something playable. Tonight I added a config file, so the player can change settings and they will remain stored for the next time they play. As soon as I finish writing this I will start working on resources for the car, so that tires can be depleted, fuel runs out over time and brakes heat up, performing worse under heavy use, although quickly cooling back off. Once I get that working I will need to add some more things to the track editor, and start making some tracks and content… We will see. In other news I added music, for now it is just temporary although I am going to be getting in contact with a musician sometime (I hope). Have a good time, and congratulations to all those in the community that finished their games in October!!! Progress has been a lot slower these past few days. Sunday I has to do a bunch of stuff in the morning, had many interruptions and distractions while I could have been working, and had other stuff to do that took a few hours in the evening. Basically no progress. Monday after work was pretty much the same, although a little bit of progress was made. I now have the game connecting to a database, and sending information to it. This will be used for best times, world records and that sort of tracking. Tuesday not much progress was made by myself, but the website can now access the database and display a table of the laptimes, sorted to boot! Today has been a slightly different story. Progress isn’t blazing, but I have at least added a Message Box state, which will be used to tell the player that they are not connected to the database, and therefore any laptimes performed will not be shared, or rated. Among many, many other uses. The other day I didn’t put up screen shots of the main menu, but I will now – despite the same fugly look. This is likely what it will remain like for the Alpha build, although perhaps I am wrong. I know that over the course of development when I come to polish this screen, I plan on it looking something like the next screenshot. Forgive my concept art skills. Well actually, forgive the complete lack of any art skills! My hopes are to have this screen animated, so it looks like the car is moving along. The plan would likely be just moving the trees and clouds from right to left, while adding a subtle vibration to the car, perhaps tire rotation… Something simple but active. Anyways, I’m still trying to refactor and put together some simple UI classes so I can create other screens quickly. Also, before I go too far I will need to stop and consider localization support for any text that gets built into the game. It is best to do that sort of thing early, although I am going to attempt finding “universal” symbols/icons, and use those instead of text whenever possible. I do wish I didn’t have a day job. It is really holding back my potential progress, and really hurting me as far as my schedule is concerned. I’m hoping to release something by the end of October, but I am not overly confident it will happen. But here’s to hoping! Well I’ve decided to make my own engine/framework, choosing DirectX for visuals and DirectSound for audio. I understand this limits the current implementation of the framework to Windows only. I take this path because of future plans in 2011 with this framework. Beside, if I do find the need to port my “OctNovDec” project to other platforms, the framework does encapsulate all details; FileIO, Input, Audio, Visual, and Timing. So after getting my framework up and running on an extremely basic level, with a lot of fun whoop-de-doos, I have a splash screen. Something I said I could do in “10 minutes” ended up taking “40 minutes” because I also made a simple sprite class. My time estimations seem to lack truth… Here is the splash screen, at least in concept. A bit simple, but my best piece of art. With that I do need to change my logo. “Presents” must be removed or replaced; I’ve thought of Studios, but it is just me. I’ve thought of Games but that could be limiting – even if it is what I am focused on at these times. I could leave it just BlackBird, but I’m not sure. In any case, when I have a Main Menu, this will fade nicely into it. So, this is what I achieved as of last night, October 1st. Today I’ve got some simple sprite based font system working, a finite-state machine for different Game States, and now progressing to work on the editor. May come back to edit. Yay for my first actual post! You are currently browsing the archives for the Scrapyard Racing category.